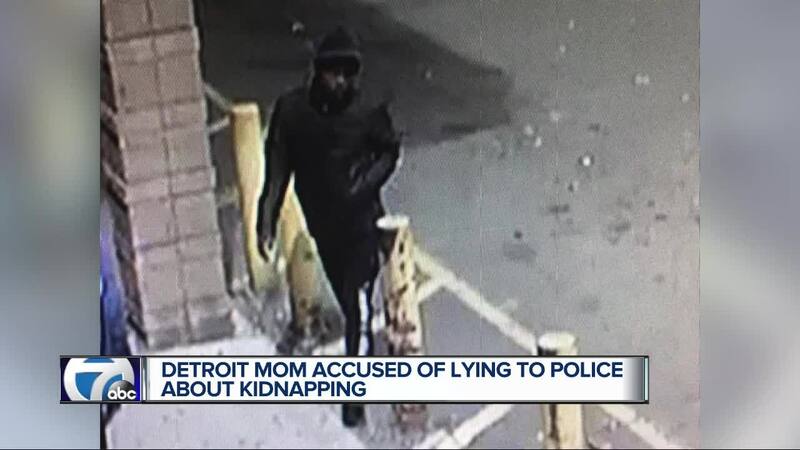 DETROIT (WXYZ) — UPDATE: The child has been found at his grandmother's home, according to Detroit Police. The grandmother has legal guardianship of the child. Police said the 4-year-old child was never alone in the vehicle when it was stolen from the Beauty Supply parking lot. His mother, 32, was arrested. The Detroit Police Department is pursuing charges for filing a false felony police report. Police continue to search for the suspect who stole the vehicle. Detroit Police are searching for a man they say took a 4-year-old child out of a vehicle that wasn't his on the city's west side. The kidnapping happened around 2:30 p.m. Saturday in the 15000 block of Joy Road. The mother of the child told police she left her young son in her running car and went into the New Urban Beauty Supply store. The suspect entered her vehicle and drove off with her child still inside. Shortly after, police found her tan 2014 Ford Fusion with heavy damage to the driver's side in the 18000 block of Fitzpatrick. The child was not inside the car, police say. The suspect is described as a black man wearing a black skull cap and black sweatpants with stripes along the side of the legs. The victim is 4-year-old Darnell Rutlege. He is about 4-feet tall with a medium complexion and short sandy brown colored hair. He was last seen wearing a navy blue hooded sweatshirt with a red t-shirt underneath, navy blue sweatpants and boot-style braces on his legs. If you've seen young Darnell, recognize the suspect or have any information about the kidnapping, call Detroit Police at (313) 596-5600 or Crime Stoppers at (800) SPEAK-UP.